After observing Claressa Shields’ impressive Thanos-like retrieval of the Middleweight division’s IBF, WBA and WBC belts; WBO champion Christina Hammer finally enters the ring fully suited up – in trunks, with a mouth guard and gloved up – to thwart Shields’ GWOAT takeover at 160-pounds. Showtime Boxing and Salita Promotions deliver the monumental, and eagerly anticipated, bout to fans Saturday, April 13, live from Boardwalk Hall in Atlantic City, NJ – barring another Hammer undisclosed illness. This business was scheduled to be sorted out back in November until Hammer’s medical situation postponed the showdown. For those who found their way here but aren’t big fans of reading, if both fighters show up 100 percent healthy on fight night in less than three weeks, and each woman fights her fight, Shields gets her hand raised via decision. Germany’s 5-feet 11-inch 28-year old Hammer (24-0, 11 KO’s) started fighting at the world championship over eight years ago, primarily fighting in Europe with the exception of her U.S. debut last June versus veteran Tori Nelson at Detroit’s Masonic Temple. Hammer’s unanimous decision (UD) victory over Nelson was nearly as dominant as Shields’ January 2018 UD performance versus Nelson. Whereas Shields swept all 10 rounds against the mutual opponent, two judges scored one round for Nelson on their cards in the Hammer fight. For more context, Hammer’s resume includes a pair of wide UD wins versus Rhode Island’s Kali Reis (15-7-1, 5 KO’s) – both fought in Germany in 2015 and 2016. Hammer’s advantages in this matchup are her ring experience, obviously, and her height and reach advantages. The German’s chances shouldn’t be totally disregarded, she coming to win and sounds like she’s not resigned to just being Shields’ opponent. First, a quick question is: Has Hammer faced an equivalent to Hanna Gabriels in her career? Hammer’s keys to complete her mission will be to keep her long jab sharp, accurate and active while utilizing her footwork to maintain the range from which she’ll be the most comfortable. With the jab established, as she gets her timing together she needs to add in powerful secondary punches to give Shields the offensive look that the aforementioned Gabriels was able to do the best. Hammer lacks Gabriels rhythm and movement, but she will need change the pace of her movement regularly, stay off the ropes and avoid fighting with head so straight up and stationary. We rarely see elements of physicality – making the fight ugly with the use various legal rough house tactics – mixed into the women’s game, but timely clinches could be used as a means to disrupt Shields’ combination punching when Hammer does find herself in the ropes. Why not stop a possible 4- or 5-punch flurry at the second punch? That was some bonus thoughts to look for from Hammer’s perspective, but let’s get into the three reasons Shields will be triumphant – and boxing’s newest undisputed champion. Focus solely on the first round knockdown Gabriels scored versus Shields back in June in front of the Flint native’s hometown fans, and leave it at that if you want to. From that point of the fight on Shields regrouped, varied her entrances into the pocket, and consistently exited while limiting Gabriels opportunities to return fire. A fight can’t be won decisively taking the exact number of punches a fighter is giving. One of the major changes to Shields’ game since the switch to trainer John David Jackson, is to eliminate longer flurries of punches in favor of smarter short combinations with ideally a higher concentration of power. Ever watch a MLB Home Run Derby and see the slugger hit a homerun on the seventh or eighth consecutive swing? Expect Shields to observe what Hammer’s offense is in-person, and to engage either at mid-range or inside once fully comfortable. Applying pressure effectively will allow Shields to seize control of how the fight will be fought, but her competitive spirit is one of the most impactful traits of her character as a fighter. Sometimes in elite matchups we find out that an elite fighter has just been playing a character, but Hammer will have to show more than what’s been shown to prove that’s the case with Shields. The way Shields’ comported herself at the late-February press conference contained very little bluster, and she naturally spoke of the showdown in a manner that suggests she’s all business. 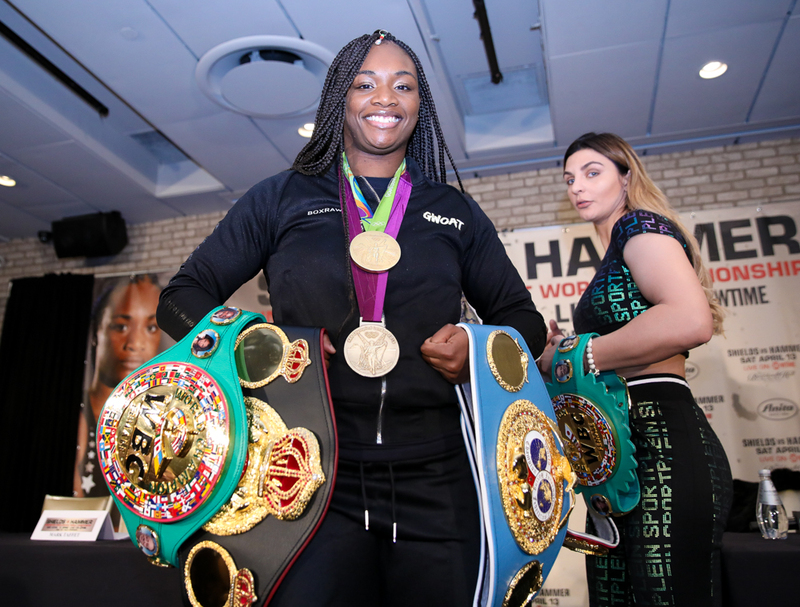 This measured approach under those lights lead this writer to believe Shields will be capable of executing chess moves on April 13. Again, after the Gabriels knockdown, Shields’ sharpness among a variety of defensive concepts was stellar. More importantly, versus subsequent opponents Hannah Rankin and Femke Hermans we are starting to see Shields increasingly create offense out of her defensive moves. Shields is able to rely on quickness, a grasp of timing and range, and reflexes to evade shots while setting up opportunities to counter or to move to an angle to go on offense quickly. Hammer didn’t show this type of fluidity in her style against Nelson, she is typically either dictating the action with her offense or in her defense. More advanced fighters are able to operate in both modes almost simultaneously. Lastly, in terms of defense, after just eight fights Shields has developed some patience in the ring that enables her to think through what her eyes are seeing, and to anticipate pretty well. She can relax better, conserve energy, and create those sudden changes of pace that can create an explosive moment when her opponent might have thought there was a lull in the action. Punch variety. Punch selection. Punch cadence. Or maybe punching array. Whatever the terminology is, the ability of fighter to string together combinations of different punches is tantamount to a wide receivers route tree – or the importance of having a route tree. In Hammer’s fight versus Nelson, the champion basically displayed solid boxing fundamentals. She fought a smart, clean fight while rarely giving up her height and reach advantage, until a late short punch from Nelson got Hammer’s attention when she had a lapse in managing distance. Against Shields, Hammer will likely have to do more than jab-right hand or double jab-right hand, and then step out to reset and repeat. In contrast, Shields’ work throughout her last few fights displayed the fruits of her effort expand offensively. Combine the objective to become a better offensive fighter, Shield is already athletic and creative, or imaginative, enough to execute some of the punching concepts her male counterparts are doing. Shields is not alone in this regard, there are several other women in the game with a sound vocabulary of punches, but the mix of Shields’ total skill set is developing. You can look at Shields’ first eight opponents and tell which ones were extremely limited in this area. Showtime’s president of sports and event programming, Stephen Espinoza, was absolutely right about Shields vs Hammer in his opening remarks concerning this fight. “This isn’t just an important women’s fight. This isn’t just a high-quality women’s boxing match. This is a high-quality boxing match. This is an important fight. So certainly we have two very skilled women, we’re not going to ignore that fact. But this is one of the best fights that can be made in this sport. Two pound-for-pound boxers, the best fighting the best. If you are not interested in this fight, then candidly, you are not a boxing fan. This is as good as this sport gets. All of the details of the undercard have yet to be finalized, so an impressive unconfirmed rumor hurts this writer’s final big sell regarding the quality of this event – or what the televised line-up could be. Tune in April 13, learn who’ll become boxing’s newest undisputed champion, and as for the rumored appearance we’ll have to rely on social media for the time being. Also, prior to fight night, be on the lookout for Showtime’s two-part All Access: Shields Vs. Hammer program, starting with the March 29 premier episode.